I live in Columbus, GA (United States). 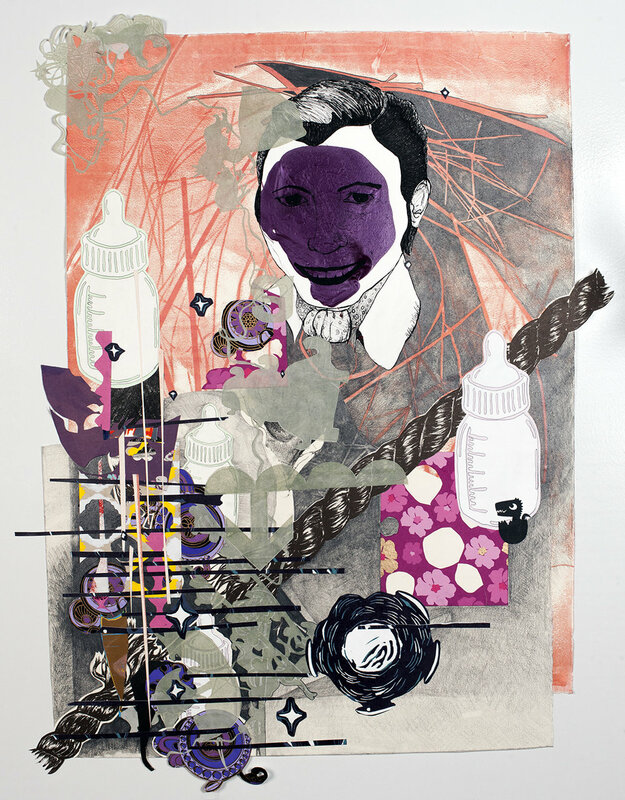 Currently I am working in collage; using a combination of drawing materials and printmaking processes. We have two children, a son who is soon-to-be 8 and a four year old daughter. Fortunately, I do have a separate studio outside of my home. While I have worked from home in the past, I found it quite difficult to remain focused - there was always laundry to be done or a baby to care for. Now, I mostly work alone, but there are days one (or both) of my children are “studio assistants”, while I normally don’t get as much done, it's usually fun to have them around. I set up a table for them to work; they usually entertain themselves with a mix of drawing, playdough, and Netflix. A typical day for me starts at 5:15am and ends around 10pm. Each morning my husband and I get the kids fed, ready for school, laundry started, and I try to walk two miles each morning before heading to work at 7:30am. The majority of my days are spent teaching (I’m an art professor) and completing administrative work. In the late afternoon I head home to collect the kiddos, help with homework, pack lunches, attend baseball games, cook dinner, etc (all the “stuff” parents do each day). Luckily, I have a supportive husband, he is as involved as I am - I’m not sure how I’d do it without him! Over the last year, I re-committed myself to my studio work and every month set a “studio schedule” for myself. I try to spend between 3-6 hours in the studio each week. It may not sound like a lot, but between work and home life, I find any designated time an accomplishment! For me, taking part in the Artist-Residency-in-Motherhood (ARIM) to be a big motivator in setting time aside for myself and prioritizing my studio practice. Yes, I have found the lack of time to be the biggest challenge when it comes to balancing being an artist and mother. I have found making connections with other artist-mothers through organizations such as ARIM and Spilt Milk to be a life-saver. I get inspiration, and motivation, from seeing what other mothers are making and doing. Following other artist-mothers on social media platforms have empowered me to feel confident in making work about the joys and struggles of motherhood. Make time for yourself. And don’t feel guilty about it. Easier said than done. Which is why I set a monthly “studio schedule”; it gives me the agency to “say no” to meeting requests when I plan to make work, plus it holds me responsible to make work when I’ve planned. These days, my kids and family life inspire my artmaking. I’ve also learned how to work more intuitively, by watching my kids create. They demonstrate such freedom. I’ve also become more confident, in my making process, by watching my husband (who is a sculptor) work. Our work is nothing alike, he will arrive at a location, work with a group of people to build large-scale installations, on the spot, within short time periods. I however, work alone and spent several weeks reflecting on my work. But when he visits my studio, he pushes me to make quick decisions - a process that is beneficial and challenging. As far as role models go, I’m not sure. 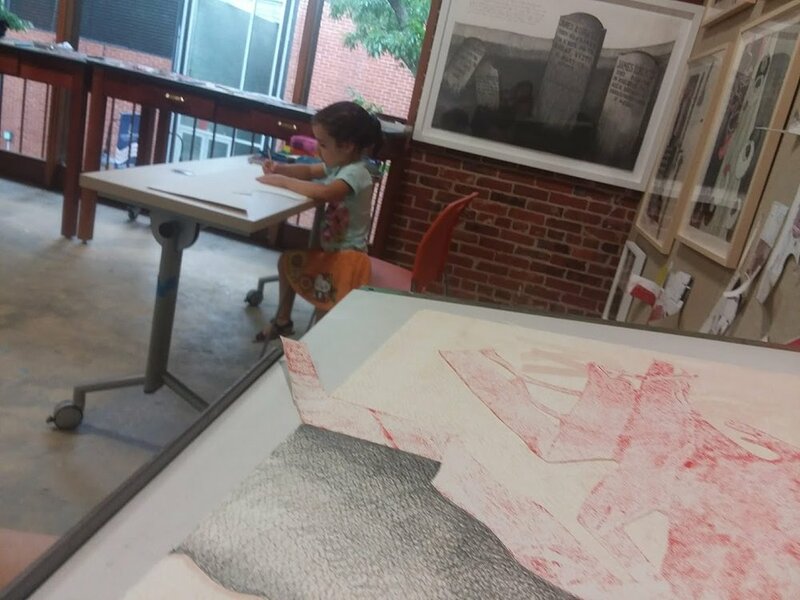 I can tell you in 2014, I hosted a visiting artist in our department, his name is Jon Swindler, a printmaker from UGA. He was speaking to the students about how becoming a father had impacted his art making. He discussed re-thinking the way “one works”; I don’t think I was his intended audience, but listening to him and watching the demonstration - got me thinking and helped motivate me. At the time I was completing large scale prints and drawings that took 70+ hours to complete and I didn’t have the time to make those anymore. Jon helped me see what was right in front of me - I didn’t have to work “that way” and now, I don’t. Yes, everything seems to have changed. At times, I feel that I have “lost” my identity as an independent person. My children’s needs come first and it's hard to remember what it felt like to have “free-time”. While this loss of part-of-my-identity can be seen as a negative, it can also be seen as a positive. Being a mother has taught me about myself: my limits, my potential, my stesses, how to do more with less time. This influences my work as I make work about the duality. The joy and the struggle. The sadness and humor. The good and the bad. The loss of time and the new experiences. It seems nothing is ever 100% and I think talking about those juxtapositions allows me to connect with viewers on a more intimate level. That's a tough question. I am very proud of my family and my career. I hope they see me as a strong female and a loving mother. Of course, I hope they know I love them and that I love their father. We are trying to teach them to work hard, have a voice, and to believe in themselves. I’d like to think, Mike and I are raising children who will grown up believing in equality, adults who are critical thinkers, demonstrate kindness, have empathy for others. They are young yet and we have a long way to go, but everyday I am proud of the little people they are becoming.